This is where la dolce vita originated, after all. 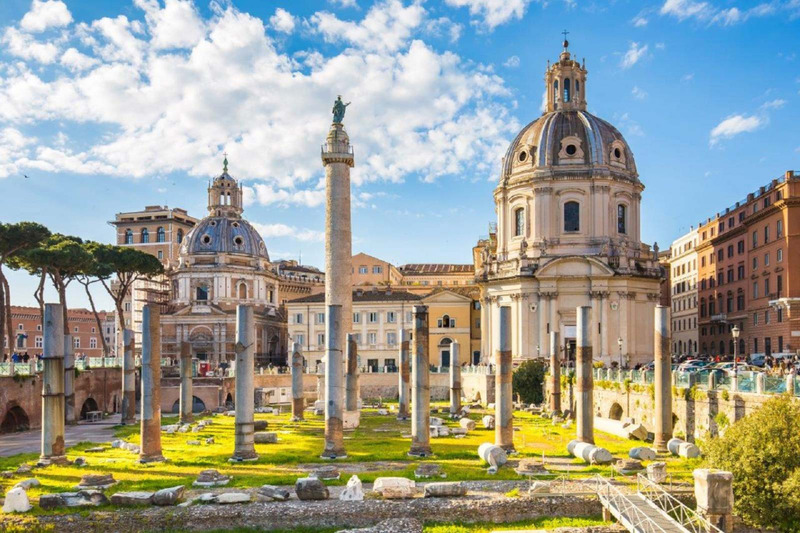 Of course, after more than 2,000 years in existence, there’s enough to explore to keep you busy for years, with decadent pasta and gelato to indulge in, places to shop for everything from handicrafts to haute couture, archeological sites, Baroque churches, villas-turned-museums, and enough art to overload your senses. The Pantheon in Rome is, hands down, my favorite building in the city. In a city that is simply replete with important historic buildings and monuments, the Pantheon still manages to stand out. Because while the Forum requires a spectacular imagination (or a spectacular guide, or both) and even the Colosseum is a shell of its former self, the Pantheon looks today – inside and out – much the way it has for nearly 2,000 years. Those marble floors you’re walking on? Yeah, people have been walking on them for two thousand years. The building’s been in constant use for two thousand years. Sun (or rain, depending on when you visit) has been streaming through the oculus for… Well, you get my point. If book history leaves you yawning, give real-life history a try. This is the stuff that gives me chills. I’ll confess that on my first draft of this list, I actually left Rome’s most famous monument, the Colosseum, off. I know, I know. But hear me out – back when I first visited, the lines were atrocious, the gauntlet of sweaty men dressed in plastic gladiator attire pressuring you to pay for a photo with them was annoying, and the interior of the Colosseum itself was (I thought) kind of disappointing after all the build-up. But the truth is that it’s the largest remaining Roman-era amphitheatre anywhere, and although the inside was used as something of a rock quarry for later building projects (if you think it looks torn apart inside, that’s because it was), it’s still a fascinating look back at one very important (though gruesome) aspect of life in the ancient capital. You’ll be well-served by a good guide (either a book, an audio-guide, or a person) to explain things, and you can avoid the worst of the ticket lines by buying a combo ticket – good for the Forum and the Palatine Hill as well – at one of those other two locations. While Vatican City is technically its own independent city-state, no one visits Vatican City on its own without visiting Rome as well. For most travelers, touring the Vatican is one day out of a trip to Rome, and that’s exactly what I suggest when people ask me how much time they should spend in Vatican City – but in addition to allotting a day for the Vatican, I also highly recommend signing on to a good guided tour of the Vatican. This will not only help you navigate the maze of the Vatican Museums (and make sure you don’t miss any of the truly important stuff), a good guide will also help you understand the context of what you’re seeing as well. And whether or not you’re Catholic, a visit to St. Peter’s Basilica is made infinitely more interesting when you know what it is you’re looking at. I’m one of the people for whom Rome remains more overwhelming than enticing, so although there are things about the city that I genuinely love I also need a break from the cityness of it from time to time. My favorite relatively peaceful haven is the Trastevere neighborhood during the day, and I think it’s an area everyone should visit even if they’re not in need of a retreat. The cobbled streets are mostly car-free, the restaurants and cafes serve up some of the cheapest eats you’ll find in Rome (and it’s good, too), the shops aren’t hawking the usual tourist crap, and the piazza in front of the Santa Maria in Trastevere church (which is beautiful) is as charming and delightful as you’d find in any Tuscan hill town. After nightfall, the Trastevere becomes the place to be for young locals and travelers alike, so it loses its “retreat” quality after dark, but it then becomes interesting for many other reasons. Every Italian city has an outdoor market where you can buy foodstuffs, and cities the size of Rome have several. But the one that’s worth your time to visit is the market at Campo dei Fiori. It’s not far from the famous Piazza Navona, and while the name means “field of flowers” it’s been the setting for a daily morning food market since the mid-1800s. Far from being just a tourist attraction, the market at Campo dei Fiori – like nearly all Italian food markets – is where locals come to stock their kitchens. If you’re staying in a hostel in Rome or have an apartment rental with a kitchen, you can peruse the offerings and buy what you need to cook your own meal. If you don’t have a kitchen at your disposal, don’t worry – you can still interact with the vendors by purchasing the makings of a lovely picnic lunch. The market is only in the piazza in the mornings, so you can’t sleep in or you’ll miss it. And don’t forget to read up on all the market rules you’ll need to know before you buy.